Il Rifugio Degli Artisti translates as The Refuge of the Artists, so-called because this charming accommodation accommodation was previously an artists’ studio. Take a look at our Rooms & Services page for more information or alternatively view the property for yourself in our Photo Gallery or Video Tour. In fact each of the 3 rooms offered was previously a separate artist’s studio and consequently the property is full of character. Located near Piazza del Popolo and the Spanish Steps, the property is in the centre of Rome within easy reach of the city’s main tourist attractions. 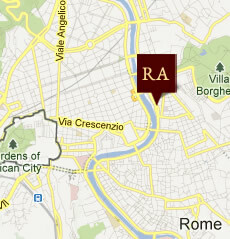 Situated close to the ancient meandering River Tiber, the Rifugio Degli Artisti accommodation is in a picturesque location with the Castello Sant’Angelo and the Vatican a short walk across the river on one side, and on the other Piazza del Popolo and the idyllic park of Villa Borghese. As if all of this wasn’t enough, Piazza del Popolo is also home to an underground metro station which means that within moments, guests can be at all the main tourist attractions via underground train. Each room is full of character having previously been an artist’s studio and decorated with handmade furniture and Italian antiques. Completely renovated, the property even incorporated stones from the original Roman walls which have been left visible. There are 3 rooms available and each one is spacious, well-lit and very comfortable. Each room is also fitted with a fixed or mobile easel for painting or drawing and we even offer painting or photography courses with professionals affiliated with our accommodation!!! The Bed and Breakfast is located in the lower part of the building, ome of the rooms have no windows but have natural or artificial skylights. Our staff are available 24hrs per day to assist you.